SoundBytes: Sound Bytes Round 3 - Fight! A lack of internet has prevented earlier announcements of the forthcoming Soundbytes Round 3, but finally(!) we are able to announce the next gig! March 27th, upstairs at Queensberry Hotel, cnr of Swanston and Queensberry Streets in Carton, we are thrilled to be holding Soundbytes Round 3! 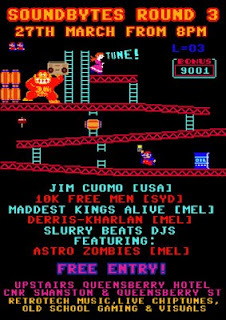 Joining Soundbytes regulars, 10K Free Men and Their Families and Slurry Beats Collective - featuring, for the first time, Astro Zombies and also returning artist Derris Kharlan, are a couple of new (to Soundbytes) acts, Maddest Kings Alive and our very special guest from the USA, Jim Cuomo! The night will have free entry and will have a film crew from ABC2's 'Good Game' in attendance to record the show for an uncoming Chiptune segment. As always, there will be retro games to play, some awesome retrotech acts to see and many drinks to have.